The day had arrived when the kids were finally leaving on their four night circus camp excursion with the school – otherwise known as Class Verte. The suitcases were packed and the kids were bursting with excited/nervous energy. 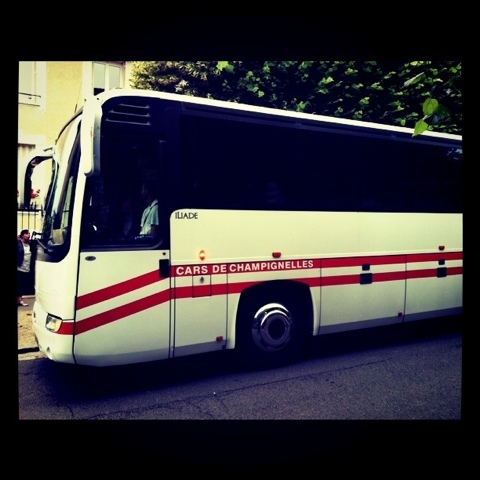 As we rolled into school with our luggage, there was an enormous swanky bus waiting for the kids outside of the school. Owen’s teacher quickly found me, asking about any medicine he might have to take, since he had been out sick from school the day before. I handed her the bag of medicine and when she opened it up to look inside, she pulled out the enormous jar of Nutella with a questioning look on her face. Since I have no idea how to say, “Trust me, you’ll need it,” in French, I just patted her on the arm and I think she got the idea. Or at least she knew that the Nutella didn’t end up in the medicine bag as a mistake, because she put it back in with the giant pills. The kids boarded the buss and there was lots of waving, many pictures and few tears (as far as I could tell). In fact, most of the French parents seemed very happy to have their kids drive away on a bus. I had mixed feelings, but I was mostly happy that my kids were going to have such a great adventure. Catherine: That’s so exciting about Class Verte! Where are the kids going? Me: They’re going to a town about 45 minutes south of here. Catherine: What’s the name of the town? Me: I can’t remember exactly. Catherine: And what’s the name of the camp again? Me: I think it’s called Cocico. Not sure if that’s the real name of the camp or the name of the program they run. Catherine: Let me get this straight – you just sent your kids off on a big bus in a country that they barely know, with a group of kids they barely know, who are speaking a language that they barely speak, to a town you don’t even know the name of? Catherine: I’m only kidding! I’m sure they’ll have a great time. This entry was posted in culture and tagged classe verte, cocico. Bookmark the permalink.